Tim Brookes' books include A Hell of a Place to Lose a Cow (one of the Top Travel Books of 2000–the New York Times and Booklist), Guitar: An American Life (one of the Best Books of 2005–Library Journal), and Thirty Percent Chance of Enlightenment. 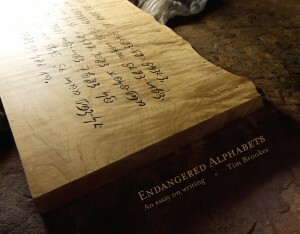 Page 99 of Endangered Alphabets consists mostly of a photograph of a piece of wood. The piece of wood—more accurately, an inch-think slab of Vermont maple--is irregularly-shaped, sports a fair number of worm-holes, and is inscribed with a chain of what appear to be symbols. Some look like letters; some look like mathematical symbols. The whole effect is very odd. The rough-cut nature of the wood, and the fact that these marks trail unevenly across the board, rather than being arranged in neat horizontal rows, make the whole ensemble look primitive—yet these marks are clearly man-made and demonstrably imply meaning. It’s like looking at the verbal equivalent of Stonehenge: it clearly means something, but what? Or maybe a crop circle—the fact that some of the signs are apparently mathematical makes it all seem eerie, almost alien. It is, in fact, two sentences in the endangered North African script known as Tifinagh. By falling midway through the book, page 99 just happens to lie within a sixteen-page folio of photographs, and as such it unites both Endangered Alphabets, the book, and the Endangered Alphabets Project, a series of carvings that commemorate and preserve more than a dozen of the world’s writing systems in danger of extinction. The whole thing started with the carvings. I got it into my head to carve Article One of the Universal Declaration of Human Rights (“All human beings are born free and equal in dignity and rights. They are endowed with reason and conscience and should act towards one another in a spirit of brotherhood“) in boards of Vermont curly maple to draw attention to the fact that the world’s unique writing systems are vanishing even more rapidly than the world’s endangered languages. Once I started carving the Alphabets, though, I started noticing that seeing the same two sentences in such different scripts raised all kinds of questions about writing itself: how it was first conceived, how it developed, how it spread from culture to culture, how it was affected by developments in technology and vice versa, how it expressed not only meaning but individual character, cultural assumptions, even the surrounding environment. These insights, along with research into the Alphabets themselves, came to make up the book Endangered Alphabets. Tifinagh was little more than a curiosity to me until I came across online photographs of the wall of a cave deep in the Sahara desert. The site is called the Wadi Matkhandouch Prehistoric Art Gallery, near Germa in Libya. It's startling to find any evidence of human presence in such an inhospitable place, so far from what we think of as civilization. And this meandering strand of symbols occurs in the same set of rocks and caves as an incredible array of carvings of animals: giraffes, lions, crocodiles, elephants, ostriches, two cats apparently fighting. This twisting strand of language looks so old and so deep it might just be the DNA of writing. Oh, and did I mention that the symbols or letters are in such a strange and vivid red pigment that they look as if they've been written in blood? It’s like a missing link, the verbal equivalent of the famous prehistoric cave paintings at Lascaux in southwestern France. Written language was here, it says (and in other sites, too, such as the one between Tamanrasset, chief city of the Algerian Tuareg, an oasis high in the Ahaggar Mountains, and Djanet, deep in the desert), long before anyone thought to write in straight and level lines. The individual letters have the same combination of angular purpose yet prehistoric crudity that challenge the sense at Stonehenge. Something is being born. It is a defining moment in human intellectual history: not just representation, a panorama of hunting, but early, early, unbelievably early symbolism. It’s as if we’re looking at the invention of meaning itself. Visit the Endangered Alphabets Project website and blog. 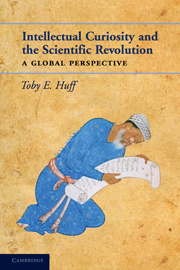 Toby E. Huff's "Intellectual Curiosity and the Scientific Revolution"
Toby E. Huff is Research Associate in the Department of Astronomy at Harvard University (and Chancellor Professor Emeritus in the Department of Policy Studies at UMass Dartmouth.). He has been attempting to understand why modern science arose only in Western Europe and not in China or the Islamic world. He first explored this big question in The Rise of Early Modern Science: Islam, China and the West (1993, 2nd 2003). His new book, Intellectual Curiosity and the Scientific Revolution: A Global Perspective, brings the discussion up to the end of the seventeenth century and Sir Isaac Newton’s grand synthesis, The Principia Mathematica. The scientific revolution unfolded in Europe in the 17th century and needs to be seen against the backdrop of the cultural climates of China, Mughal India, and the Ottoman Empire. Not to be forgotten in this context is the invention of the telescope in 1608 and Galileo’s use of this discovery machine in 1609-10 to reveal the rough, cratered surface of the moon and the four satellites of Jupiter. These discoveries added weighty new evidence to support the Copernican, heliocentric hypothesis. Subsequently the telescope revolutionized the practice of astronomy in Europe by encouraging and enabling the constant search for celestial novelties. So what if the telescope went to China, Mughal India, and the Ottoman Empire during these early years when it was transforming European thought and practice? Would it have the same impact outside of Europe where it is thought that astronomy had a glorious past? Page 99 of my book takes the reader into the so-called Rites Controversy in China in the 1660s, approximately four decades after the telescope arrived. At that time Adam Schall von Bell, a Jesuit scientist who was a student in Rome and heard Galileo speak at the Roman College in 1611, was now at the helm of the Chinese Bureau of Astronomy and Mathematics. Because of the clear predictive superiority of European astronomy, still based on the geo-heliocentric models of Tycho Brahe (who died in 1601), the Chinese had been persuaded to adopt the new Western system. But being in charge of that Bureau meant that Schall had to make divinatory decisions within the traditional Chinese astrological system. In this case he had to choose an auspicious date and site for an Imperial burial. When Chinese scholars hostile to Schall and the new system repeatedly attacked Schall, his authority waned. He, his European and Chinese associates ended up under house arrest, sentenced to death. This is perhaps the most dramatic encounter between “East” and “West” involving the new astronomy and the telescope. It was taken to the Mughals and to the Ottomans during the first quarter of the seventeen-century, where at least one merchant lost his life for using a telescope to view forbidden scenes. 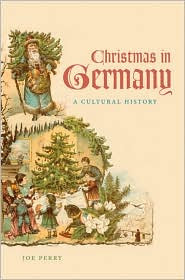 The book, however, contains much more about revolutionary scientific discoveries in Europe in other fields such as anatomy, microscopy, hydraulics, and electrical studies that set Europe off from other parts of the world for the next four hundred years. Learn more about Intellectual Curiosity and the Scientific Revolution at the Cambridge University Press website. Louise Shelley is Professor of Public Policy and Director of the Terrorism, Transnational Crime and Corruption Center at George Mason University. My book, Human Trafficking: A Global Perspective (Cambridge, 2010) examines all forms of human trafficking globally, revealing the operations of the trafficking business and the nature of the traffickers themselves. Using a historical and comparative perspective, it demonstrates that there is more than one business model of human trafficking and that there are enormous variations in human trafficking in different regions of the world. I conclude that human trafficking will grow in the twenty-first century as a result of economic and demographic inequalities in the world, the rise of conflicts, and possibly global climate change. Page 99 of the book is halfway into the third chapter devoted to Human Trafficking as Transnational Organized Crime. This section on the recruitment of trafficking victims addresses some of the major themes of the book that citizens of failed post-socialist transitions, individuals displaced by conflicts, and large scale natural disasters are likely victims of human trafficking. As the book shows, the last twenty years have been ones of significant growth in human trafficking as the Soviet Union and other socialist states collapsed, the end of the superpower conflict resulted in the rise of numerous conflicts internationally. Moreover, with increased problems of climate change, the number of natural disasters has increased leaving ever larger numbers susceptible to exploitation. Page 99 focuses on two particular regions in which victims are recruited: the former Soviet Union and Iraq. In contrast to many books on human trafficking, this book focuses on labor as well as sexual trafficking. Trafficking from the former Soviet Union is not only the widely publicized trafficking of women for sexual exploitation. Rather a larger number of victims are those exploited within the countries of the former Soviet Union as laborers. Particularly numerous are the male trafficking victims from Central Asia who work in Russia and Kazakhstan where they often work long hours without days off for substandard wages or are even deprived of their wages. These illegal workers are often poorly educated, unlike their counterparts in the United States, who were once highly trained professionals but are now working in menial work in the American shadow economy. The discussion of Iraq shows that human smuggling and trafficking out of Iraq preceded the invasion that ousted Saddam Hussein. In Kurdish Iraq, in the late 1990s, a sophisticated business existed that smuggled individuals out of the country. Families would sell their homes to pay for the high costs of smuggling hoping to get members out of the country who could repatriate money or establish a foothold overseas. This smuggling was not always successful and Kurds were sometimes imprisoned as illegal immigrants in Europe. Or, as is shown elsewhere in the book, those who started out in a consensual relationship with their smugglers wind up as trafficking victims. Read an excerpt from Human Trafficking, and learn more about the book at the Cambridge University Press website. Harold Schechter is a professor of American literature and culture at Queens College, the City University of New York. Among his nonfiction works are The Devil's Gentleman and the historical true-crime classics Fatal, Fiend, Deviant, Deranged, and Depraved. Schechter also writes a critically acclaimed mystery series featuring Edgar Allan Poe, which includes The Tell-Tale Corpse, The Hum Bug, Nevermore and The Mask of Red Death. I can’t judge whether p. 99 reveals the quality of my book but it certainly gives a misleading idea of its subject. Killer Colt interweaves the stories of Samuel Colt, legendary inventor of the revolver, and his brother John Caldwell Colt, a well-known accountant and the central figure in one of the most sensational American murder cases of the nineteenth century. In September 1841, Samuel Adams, a respected printer with a shop in lower Manhattan, paid a call at the office of John Colt, who had hired Adams to produce the latest edition of a popular book-keeping textbook he had written. Adams was there to collect a debt. The two began arguing over the amount. Before long they were trading blows. The altercation ended when Colt bludgeoned Adams to death with the blade of a shingle hammer. He then stuffed the mutilated corpse into a packing crate, addressed it to a nonexistent person, and attempted to ship it off to New Orleans on a boat scheduled to leave the next morning. Unfortunately for him, a storm rolled in, preventing the ship from leaving port for a week and the horrific murder came to light. Thanks to penny-press publisher James Gordon Bennett, the much-reviled pioneer of tabloid-style journalism, the story became a newspaper sensation, displacing other notorious crimes from the front page. Among the latter was the still-unsolved murder of the “Beautiful Cigar Girl,” Mary Rogers, whose case was the basis for Edgar Allan Poe’s famous detective story “The Mystery of Marie Roget.” Page 99 of Killer Colt comes from a chapter about Bennett and deals not with Colt but with Mary Rogers. A reader opening to that page might think the book was about a completely different crime (one expertly covered in Daniel Stashower’s 1997 true-crime history, The Beautiful Cigar Girl). Read an excerpt from Killer Colt, and learn more about the book and author at Harold Schechter's website. A. J. Langguth's "Driven West"
A. J. Langguth is professor emeritus of journalism in the Annenberg School for Communication at the University of Southern California. His books include Union: 1812, Patriots: The Men Who Started the American Revolution, and Our Vietnam: The War, 1954-1975. Sam Houston, an aide to Andrew Jackson, had just shown Jackson a letter proving that his running-mate for the presidency, John Calhoun, had once urged James Monroe's cabinet to censure Jackson for his earlier military adventures in Florida. Reading of Calhoun's duplicity set off one of Jackson's rages: "It smelled so much of deception," Jackson said, "that my hair stood on end for one hour." In that quote and in the many others from the book, it's Jackson's insistence on the specific detail ("for one hour") that helps to bring him to life for me. When he was consoling the wife of his Secretary of War for being the target of sexual innuendo in the capital, Jackson said, "I tell you, Margaret, I had rather have live vermin on my back than the tongue of one of these Washington women." Jackson often reminds me of Lyndon Johnson, also adept with a trenchant phrase. But the judgment on their presidencies is very different, and I think unfair. LBJ's towering achievements have been blighted by the Vietnam War, while Jackson usually has been forgiven for his slaves, for his ruinous economic policies and for forcing the Cherokee Nation at bayonet point down the Trail of Tears. Learn more about Driven West at the Simon & Schuster website, and visit A.J. Langguth's website. Edward Berenson's "Heroes of Empire"
Edward Berenson is Professor of History and Director of the Institute of French Studies at New York University. He is the author of Populist Religion and Left-Wing Politics in France and The Trial of Madame Caillaux. Is “the quality of the whole” revealed on page 99 of my new book, Heroes of Empire? That’s, of course, not for me to say. But bizarrely enough, that one page features several of the book’s most important themes. 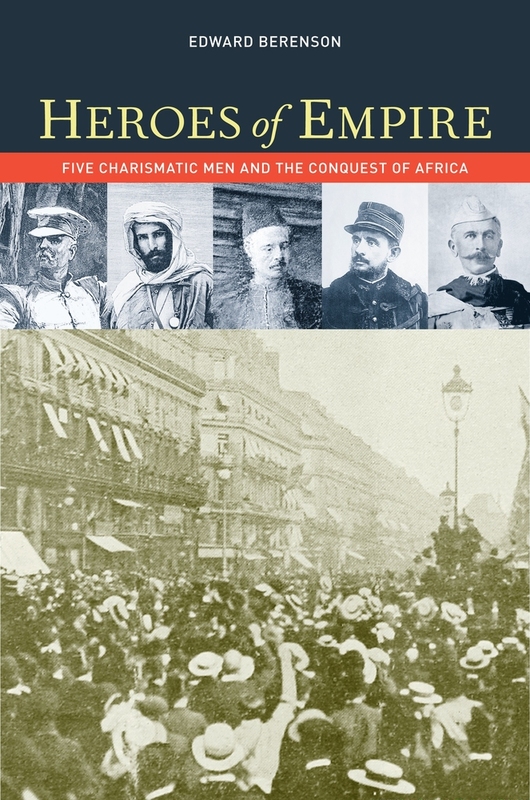 Heroes of Empire tells the story of five colonial figures, two British and three French, who made imperial conquest exciting, even exhilarating, for millions of ordinary citizens. Most British and French people never set foot in their country’s imperial possessions, nor did they have any economic interests there. But between 1870 and 1914, imperialism became a popular phenomenon. The press gave it top billing and advertisers embraced its “exotic” imagery. Above all, people looked up to the charismatic heroes whose adventures, richly narrated in penny papers, seemed to turn overseas expansion into a series of extraordinary, personal quests. 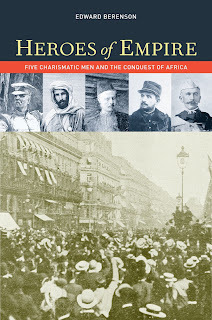 Page 99 comes about halfway into my chapter on Charles Gordon, one of Lytton Strachey’s “eminent Victorians.” Gordon was shyer about publicity than his countryman Henry Morton Stanley, an ardent, if ambivalent, self-promoter. But as I note on this exemplary page, Gordon did allow Vanity Fair to lionize him in one of its famous “Men of the Day” portraits. Stead’s front-page interview revived Gordon’s charismatic appeal and helped convince William Gladstone’s supposedly anti-imperialist government to send the hero to Khartoum. The Mahommedan Power, aka the Mahdi, had trapped British troops there, and a great many writers, Stead included, claimed the general would singlehandedly bring them home. Instead, Gordon too found himself besieged in Khartoum, where he ultimately fell to a Mahdist sword. The hero became a martyr—a Victorian legend and imperial saint. Learn more about Heroes of Empire at the University of California Press website. Misha Angrist's "Here is a Human Being"
Misha Angrist is Assistant Professor of the Practice at the Duke University Institute for Genome Sciences & Policy and a Visiting Lecturer at the DeWitt Wallace Center for Media and Democracy inside Duke's Sanford School of Public Policy. He holds a PhD degree in Genetics from Case Western Reserve University and was formerly a board-eligible genetic counselor. Angrist received his MFA in Writing and Literature from the Bennington Writing Seminars. He is a past winner of the Brenda L. Smart Fiction Prize and was nominated for the Pushcart Prize. In April 2007 he became the fourth subject in Harvard geneticist George Church's Personal Genome Project. In 2009 he was among the first few identifiable persons to have his entire genome sequenced. I have spent most of my adult life studying and thinking about human heredity at an intellectual level. In this book, I wanted to understand it at a visceral level and a personal one. The Human Genome Project cost close to $3 billion. My personal genome cost $23,000. Your entire DNA sequence will almost certainly cost a small fraction of that. What will you do with that information? How will you perceive it? Who should have access to it? What does it mean? A few months earlier she’d sent me her travel schedule: Moscow, Brussels, London, New York, Aspen, Washington—and that was just June. No wonder she had no land telephone line—it would atrophy from disuse. As a consultant to the air taxi business, she was ferried all over the globe on someone else’s nickel, which made her life seem like some kind of Condé Nast Travel/Wired mashup of “Where’s Waldo?” If I wanted to know where she was, she suggested I follow her on Dopplr, whatever that was. Esther is not a typical PGP participant. Indeed, she's probably not a typical anything. And I think that that's the point: Curious people with an appetite for risk come in all shapes, sizes and colors. If it is successful, personal genomics will afford them an opportunity to learn about themselves, each other, and the latest and greatest model organism: Homo sapiens. Learn more about Here is a Human Being and Misha Angrist. Dan P. McAdams' "George W. Bush and the Redemptive Dream"
Dan P. McAdams is the Chair of the Psychology Department and Director of the Foley Center for the Study of Lives at Northwestern University. He is the author of The Redemptive Self: Stories Americans Live By, which won the American Psychological Association’s 2006 William James Award for the best general-interest book in Psychology. In the spring of 2003, President George W. Bush launched an American military invasion of Iraq. From a psychological standpoint, why did he do it? In George W. Bush and the Redemptive Dream, I argue that Bush’s momentous decision was the product of a perfect psychological storm – a confluence of world events, personality dispositions and goals, and the president’s peculiarly redemptive story for his own life. After years of drinking and waywardness, Bush fashioned a story in his mind about how, through self-discipline and God’s guidance, he had triumphed over chaos, enabling him to recover the freedom and goodness of his youth. In the days after 9/11, President Bush projected this very same narrative of redemption onto America and the world, motivating and justifying the Iraq invasion. We are the ancestors of modern human beings, living together in social tribes as foragers and hunters, migrating across grasslands and forests in search of food, shelter, and safety, forever on the move, on the outlook for opportunities and for dangers. Life is hard.... We are under constant threat. To survive, we must stick with our group. The group is everything. Everybody is different, although we are all part of the group. Some of us are more adventurous than others, willing to take risks, willing to explore what goes on outside the group or outside the group’s rules.... By contrast, some of us are more prudent than others, tending to rely on the tried-and-true, cautious and vigilant in our dangerous environment... Those among us who hew most closely to the group’s timeless traditions aim first and foremost to keep us safe and secure. They typically urge us to keep things more-or-less the way they have always been, or to restore a golden time we may have lost. More than the rest of us, these especially restrained and cautious members of our group – deferential as they are to established authority – affirm the wisdom of ages past. They are our conservatives. By suggesting on page 99 that political conservatism is deeply ingrained in group life and human nature, I begin to consider the development of George W. Bush’s characteristic brand of evangelically inspired political conservatism. Conservatives often look back in longing to a golden age. For Bush that golden age was his years growing up in Midland, Texas. Restoring the freedom, control, and self-determination that run through the mystic chords of George W. Bush’s Midland memories becomes the key narrative aim of his redemptive dream. In his personal life, Bush overcame chaos and restored Midland by committing himself to his family and public service, finding God, and giving up alcohol around the age of 40. In Bush’s redemptive dream, America, too, might overcome the chaos of 9/11 and restore, even for the Iraqi people, the freedom and the goodness that, once upon a time, were Midland. Because the story had played so well in his own life, the president knew in his heart that the mission would be accomplished and that there ultimately had to be a happy ending. Learn more about George W. Bush and the Redemptive Dream at the Oxford University Press website. Patrick Vinton Kirch's "How Chiefs Became Kings"
Patrick Vinton Kirch is Class of 1954 Professor of Anthropology and Integrative Biology at the University of California, Berkeley. He is the author of many books, including Feathered Gods and Fishhooks and On the Road of the Winds. The Hawaiian Islands are the most isolated islands on Earth. Yet voyaging Polynesians managed to discover and settle this large and fertile archipelago around A.D. 1000, establishing the roots of what would grow to become a unique island civilization. When he established contact with the Hawaiians in A.D. 1778, the English explorer James Cook was amazed by their complex society with its many gradations of status and rank. 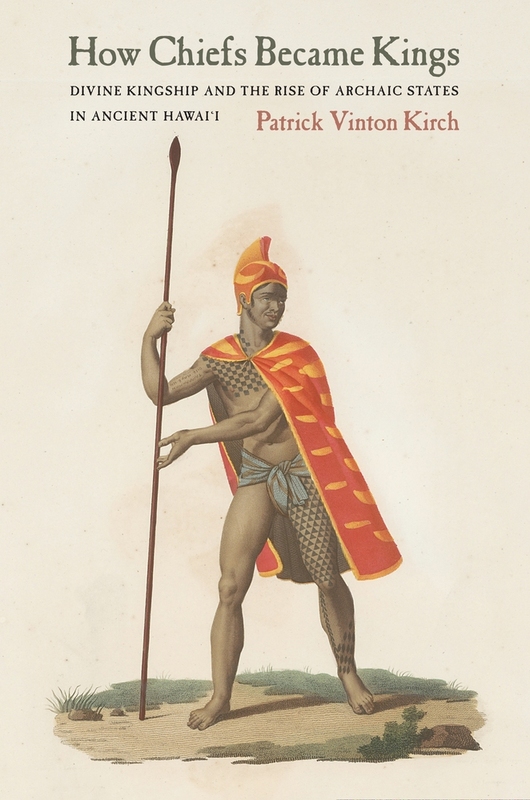 Drawing upon Cook’s account as well as other European and indigenous sources, in How Chiefs Became Kings I argue that by the time of their fateful contact with the West, the Hawaiians had invented the concept of divine kingship. Moreover, their political system had evolved from a classic Polynesian chiefship into true archaic states, as were found in other early complex societies in both the Old and New Worlds. How does chiefship evolve into kingship? The question is at the heart of long-running debates in anthropology and sociology. I argue that an explanation of this kind of socio-political change requires that we take into account both individual human agency and longer-term dynamic processes. Thus, for example, on page 99 of How Chiefs Became Kings, I examine Hawaiian oral histories regarding the first political consolidation of Maui Island, around A.D. 1600, by the high chief Pi‘ilani and his sons. I write that “a rivalry between junior and senior siblings (and hence a test of inherited privilege versus demonstrated mana) is at the core of this mo‘olelo [tradition].” It was frequently such contests between senior and junior lines that gave the impetus to conquest and political consolidation. Both Maui and Hawai‘i islands became single polities around the same time, and indeed their royal houses intermarried. Yet powerful leaders such as Pi‘ilani, or the famous ‘Umi of Hawai‘i Island, carried out their wars and strategic alliances within a broader context. Drawing upon recent archaeological findings, I demonstrate that a history of population growth coupled with significant intensification of the islands’ agricultural production systems enabled these new kings to achieve their political aims. And, once kingship had been established, new forms of ritualized control of the political economy were instituted, as is well documented in the archaeological record of monumental temple architecture. In short, my book shows how—over the course of just eight centuries—the most isolated society in the world developed social and political institutions that paralleled those of the world’s other pristine states. Learn more about How Chiefs Became Kings at the University of California Press website. Virginia Scharff's "The Women Jefferson Loved"
Virginia Scharff is Professor of History and Director of the Center for the Southwest at the University of New Mexico. Her scholarly publications include Taking the Wheel: Women and the Coming of the Motor Age (1991); Twenty Thousand Roads: Women, Movement, and the West (2003); two textbooks, Present Tense: The United States Since 1945 (1996); and Coming of Age: America in the Twentieth Century (1998); and the edited volume, Seeing Nature Through Gender (2003). If you open The Women Jefferson Loved to page 99, you’ll get a revealing glimpse of the book. You’ll be standing at the moment when Martha Wayles Skelton Jefferson, wife of Thomas, lost her father, John Wayles, and gained her inheritance. Wayles took care to see that his four daughters, Martha and her half-sisters, Elizabeth, Tabitha and Anne, received equal portions of his holdings. He was especially concerned to see that Martha, daughter of his first wife, was not cheated out of her due by any of his later wives. Jefferson would later have his own way of dealing with that potential problem. Readers may already know something of the stories of the land and the debt and the people Martha Jefferson brought to her union with her husband. Martha Jefferson inherited her father’s concubine, Elizabeth Hemings, and six of her own half-brothers and sisters. The Wayles-Jefferson-Hemings family was the very embodiment of Abraham Lincoln’s “House Divided,” a family that lived every day pretending, at least publicly, that the bonds among them did not exist, even as they were all pledged, in different ways, to take care of each other. Thomas Jefferson would carry on in his father-in-law’s fashion, himself fathering children with John Wayles’s daughter, Sally Hemings, and not insignificantly, piling up debts of his own. But what you won’t see on page 99 is the emotional quality of Jefferson’s relationships with women, the belief in love and affection that he learned at his mother’s knee. The lifelong connections, of blood and tension and affection and denial, between the enslaved and free children of John Wayles, and the family of Thomas Jefferson, were forged in kinship, and in Jefferson’s promises to women he loved. Those unequal bonds shaped everything he brought into being, from the first spring peas of his garden to his greatest public legacies. Learn more about The Women Jefferson Loved at the publisher's website. Richard Francis' "Fruitlands: The Alcott Family and Their Search for Utopia"
Richard Francis has taught at universities on both sides of the Atlantic and has written on Ann Lee, founder of the Shakers, and on the Salem witch trials. He is also a novelist. Page 99 finds the Alcott family living in their house, Concordia Cottage, in Concord, along with two supporters who have joined them from England, Charles Lane and Henry Gardiner Wright. It mostly consists of the reaction of Ralph Waldo Emerson, neighbour and sponsor of Bronson Alcott, to this ménage. This immediately foregrounds two important issues in the book. The first is that these utopians were addicted to theorizing at the expense of being practical, and the second is that Emerson was alert to their limitations. He was hoping to disrupt the utopia at the very moment of its inception. The real point was to thwart Lane’s desire to re-establish the Garden of Eden by re-enacting, on a limited scale, humankind’s subsequent expulsion from it. The idea was to use his house as “a sort of cooling furnace, or a place where he might be partially corrupted & fitted for the grossest realities of the Yankee land.” The grossest realities would of course include square meals, apples from the forbidden tree. Lane refused Emerson’s blandishments, however. The rest of the page is devoted to Emerson’s grave doubts about the viability of the proposed utopian community – scepticism which is utterly vindicated by the book as a whole - and by his slightly comic, slightly paranoid, sense of the threat they posed and of his need to be rid of the reformers. On the whole, I believe that Fruitlands passes the Page 99 Test. Learn more about Fruitlands at theYale Univrsity Press website and Richard Francis' website. Benjamin L. Carp's "Defiance of the Patriots"
Benjamin L. Carp is Associate Professor of History at Tufts University, where he teaches the history of early America. His first book is Rebels Rising: Cities and the American Revolution. The BCC [Boston Committee of Correspondence] invited the committees from the neighboring towns to meet with them at Faneuil Hall at 9 a.m. on Monday, the 29th [of November 1773], and “send as many Friends to our assistance at this important crisis as you can possibly spare.” Only with widespread supportfrom the people in Boston and its surrounding towns could the Boston Committee be certain that no one would land the tea. Bostonians awoke that Monday to find notices pasted up throughout the town. “Friends! Brethren! Countrymen!” they began. “The Hour of Destruction or manly Opposition to the Machinations of Tyranny stares you in the Face.” The notice called upon “every Friend to his Country, to himself and Posterity” to meet at Faneuil Hall at 9 a.m. These lines come from page 99 of Defiance of the Patriots, and I think this passage very much distills the excitement of the tea crisis of 1773. The merchant ship Dartmouth had just arrived in Boston the day before. It was carrying the first shipment of the East India Company's tea under the Tea Act of 1773. Now Bostonians faced a choice--would they let the tea land, and accept the sovereignty of the British Parliament? Or would they gather together, and resist? Page 99 comes from chapter 5, "The Detestable Tea Arrives," and by this point in the book, the narrative is moving ahead at full sail. This page contributes to the suspense as we anticipate the famous destruction of the tea on December 16. I spend some time describing the meetings of various groups who were reacting to the ship's arrival. I write about the consignees--these were a group of Boston merchants that the East India Company had hand-picked to receive the tea when it arrived. The Bostonians were trying to persuade these consignees to give up on their lucrative contracts and refuse to receive the tea. So far, despite threats and violence, the consignees weren't playing along. The selectmen, as formal leaders of the Town of Boston, had failed to persuade the consignees to act. Instead, Bostonians convened in a larger mass meeting as “the Body,” which accomplished several goals. First, a “Body”meeting broadened the base of interested, mobilized participants to include poorer Bostonians and residents of the outlying towns (only qualified property-owners were eligible to vote at a regular town meeting). Second, a “Body”meeting granted a broad, popular legitimacy to the political movement against the Company’s tea—and perhaps this would further intimidate the consignees. Finally, as the selectmen learned from a “Lawyer and high son of Liberty”—possibly Josiah Quincy or John Adams—the Town of Boston could not be held liable for the tea if anything untoward happened to it. In theory, the authorities could not hold a spontaneous gathering of a “Body” of people accountable for anything. The meeting of November 29 was important, but the nature of the meeting was even more important: it was big, inclusive, intimidating, and unsanctioned--just the ingredients you'd need if you were preparing for the possibility of taking a bold stance. In New York City, Philadelphia, and Charleston, the townspeople were able to persuade their local consignees to resign their commissions and decline the tea shipment. In Boston, the townspeople failed, which is why bold action became the only option. Learn more about Defiance of the Patriots at the Yale University Press website. William J. Talbott's "Human Rights and Human Well-Being"
William J. Talbott is Professor of Philosophy at the University of Washington, where he has been teaching since 1989. He has published articles in moral and political philosophy, especially the philosophy of human rights, philosophy of law, epistemology, and rational choice theory. His new book, Human Rights and Human Well-Being, is the second of two volumes on human rights. The first was Which Rights Should Be Universal? (Oxford, 2005). My book Human Rights and Human Well-Being is a book in the philosophy of human rights. It addresses such questions as: What is a human right? What reasons do we have to believe in human rights? (Hint: They are not self-evident.) What is the relation between human rights and human well-being? Noncategorical norms and principles enable human societies to evolve social practices that, over time, can do a better job of equitably promoting life prospects than any system of categorical norms and principles would. No matter what system of ground-level norms or principles a human society may have, there is always a potential for improvement. In most religious and cultural traditions, young people are taught that there are infallible, exceptionless (i.e., categorical) moral principles and rules (norms). Somehow, many of those who undergo the training acquire the ability to recognize at least some exceptions to those very norms. For example, Victor Hugo wrote Les Miserables for an audience who had been taught that it is always wrong to steal. But for the novel to be successful, Hugo had to believe that he could persuade his readers to at least think that there might be an exception for Jean Valjean, a father who was stealing bread to save his children from starvation. Throughout history, people have been ostracized and put to death for announcing that there are exceptions to the accepted moral norms, but that ability to recognize exceptions is the engine of moral progress. In Human Rights and Human Well-Being, I explain the development of human rights as a product of this process of moral improvement. I explain why it is a mistake to expect moral norms to be exceptionless. If we regard them as non-categorical (i.e., as containing exceptions), we can welcome the possibility of further improvements. Thus, it is a mistake to think that human rights (or anything else) depends on a grounding in self-evident truths. Human Rights and Human Well-Being is the second of two volumes on human rights. My first volume was Which Rights Should Be Universal? (published in 2005). Each volume stands on its own. Learn more about Human Rights and Human Well-Being at the Oxford University Press website. Steven Lubet is Williams Memorial Professor of Law and Director of the Bartlit Center for Trial Strategy, Northwestern University School of Law. Early on the morning of September 11, 1851, a Maryland plantation owner named Edward Gorsuch led a small posse in search of four fugitive slaves who had escaped to the town of Christiana, Pennsylvania. Armed with a warrant issued under the Fugitive Slave Act of 1850, Gorsuch expected little trouble when he and his men approached a stone cabin where he believed the runaways were hiding. Instead, he was met with a hail of gunfire. The fugitives had trumpeted an alarm, and soon the slavehunters were themselves surrounded by dozens of “armed Negroes” and a handful of unarmed white supporters. Gorsuch was killed in the ensuing battle and two of his men were badly wounded. All of the fugitives escaped. In the aftermath of the battle, 41 men – five whites and 37 blacks – were indicted for the capital offense of treason. Page 99 of Fugitive Justice falls squarely in the middle of the Christiana trial. At the beginning of the page we see the racism of the lead prosecutor, whose fevered imagination led him to complain loudly that the black defendants were accompanied in court by “white females.” We then see how the defense attorneys – including the abolitionist Congressman Thaddeus Stevens – took advantage of the prosecutors’ “bullying and bravado” by leading them into a trap from which their case could never recover. Stevens's brilliant advocacy won acquittals or dismissals for all of the Christiana defendants, but later fugitive slave trials did not end as successfully. Many fugitives were returned to the South in chains, and many (though far from all) rescuers were tried and convicted. As the decade progressed, resistance to the Fugitive Slave Act continued and the tactics of the abolitionist lawyers became increasingly militant. The highly publicized trials eventually helped build the northern anti-slavery movement, while driving southern firebrands ever closer to secession. Learn more about Fugitive Justice at the Harvard University Press website. Roberto González Echevarría's "Cuban Fiestas"
Roberto González Echevarría is Sterling Professor of Hispanic and Comparative Literature at Yale. He is author of The Pride of Havana: A History of Cuban Baseball, as well as major studies of Cervantes, Carpentier, García Márquez, and Sarduy. I always tell my colleagues and dissertation students that a manuscript is not going to be a book or a thesis until the 100 page corner is turned. Once you have a hundred pages a manuscript has a density of its own and a momentum that will carry you to the end, however near or far that happens to be. So I am amused with Ford Madox Ford’s statement about page 99 in a book, though ninety-nine printed pages mean over one hundred and fifty of manuscript. On page 99 of Cuban Fiestas there is a transition, from the discussion of two paintings of the “Fiesta del Día de Reyes” by conventional artists to consideration of an image on a cigarette wrapper that is part of popular culture. I also explain the ascendancy of the tobacco industry in nineteenth-century Cuba and explain Fernando Ortiz’s theory about Cuban culture being a “counterpoint of tobacco and sugar.” The cigarette wrapper is a cultural artifact quite different from the paintings. Its depiction of the ritual is particularly poignant and revealing because it is intended for a male public and its humble nature allows the artist to be explicit about the sexual nature of the celebration, and the role of the white elite in the organization of the ritual. The wrapper leads me to interpret the Fiesta as an atonement ritual in which the whites punish themselves symbolically. It could be argued that in this playing off popular culture against high art and their providing a synthesis about Cuban fiestas, this page contains the gist of my entire book. Learn more about Cuban Fiestas at the Yale University Press website.